Custom Fume Hood Solution for Cidex and Other Glutaraldehyde Products - Sentry Air Systems, Inc.
Cidex® is a well-known disinfectant in medical facilities. It is a 2.4% solution of glutaraldehyde and is frequently used to disinfect medical devices that can not be subjected to high-heat disinfection, such as endoscopes and bronchoscopes. It is also sometimes used as an all-purpose disinfectant. Glutaraldehyde, the active ingredient in Cidex®,is a well-known source of exposure disorders, including occupational asthma and contact dermatitis (localized inflammation,rashor irritation of the skin). It was first used for medical disinfection in 1963 and, by 1968, incidents of glutaraldehyde-induced contact dermatitis were reported. The hazards identified in the Cidex® MSDS are show in the excerpt below. OSHA has not published a PEL (permissible exposure limit) for glutaraldehyde, although the agency has published a comprehensive document: Best Practices for the Safe Use of Glutaraldehyde in Health Care. Because the two main routes to exposure are accidental splashes and breathing glutaraldehyde fumes (See Smith and Wang paper at the National Center for Biotechnology Information website. ), personal protective equipment (PPE) and appropriate ventilation strategies are engineering controls that can lead to a safer working environment. Personal Protective Equipment (PPE). Repeated exposure to glutaraldehyde has caused dermatitis severe enough to prompt career change. The Cidex®MSDS, for example, says that skin contact may aggravate pre-existing dermatitis. Make sure your glutaraldehyde-handling procedure mandates gloves of appropriate material, gowns, forearm protectors, goggles, and protection from fumes. Ventilation. Sterilizing medical equipment with glutaraldehyde presents several opportunities for exposure to vapors. A typical process involves washing and drying the equipment, testing the glutaraldehyde solution, placing the equipment in the glutaraldehyde solution for a specific time period, removing it from the solution, and multiple water rinses. Vapors may also be present when mixing the solution, when placing the equipment in the solution, and while rinsing the equipment. If a washing machine is used, vapors may be present when placing the equipment in the machine, when removing it, while adding the glutaraldehyde solution, and while removing it from the machine. A custom ductless fume hood can capture vapors at every step of your glutaraldehyde procedure. At Sentry Air, we design and manufacture fume capture hoods that offer worker protection from fumes no matter how customer specific the requirements are. For example, our hoods can be manufactured in custom dimensions in a range of materials, including stainless steel, aluminum and PVC. We offer custom cutouts for sinks and specialty equipment, as well as racks and hanging accessories that fit inside the hood. In the illustration below, we depict a hood enclosing a sink, hanging devices, and a top-loading washing machine. In a hood like this, at every step of the glutaraldehyde sterilization process — washing, rinsing, soaking, loading and unloading the washer, air drying – fumes created by the process are drawn away from workers and into a specialty filter that does not allow the fumes to escape into the wider work area. Here’s a link to pictures of custom hoodsSentry Air has manufactured and a link to an explanation of the steps we take to create custom hoods. 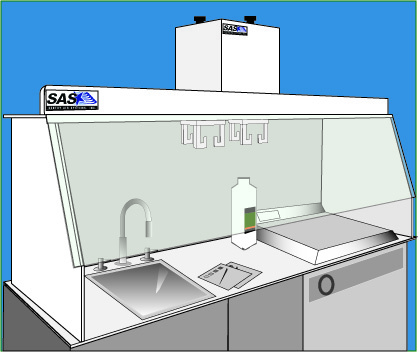 For information on custom fume hood options for your medical equipment cleaning process, give us a call at 1.800.799.4609, email us at sales@sentryair.com, or fill out this simple online form to have a Sentry Air Systems Applications Specialist contact you to discuss your process. Occupational Impact in the Health Care Environment.